Human Resources and the professionals that carry out this function play a key role in how companies develop the values that ultimately express themselves in the culture of an organization. Corporate culture is important because it is the bedrock on which a company grows and sustains the most important asset it possesses…its people. Unfortunately, culture is not as easy to either create or nurture as we would all like it to be. For many companies, the existence of culture happens on its own with little intention on anyone’s part. Lack of intention and creative commitment opens the door for less than favorable conditions to creep into the cultural environment. Not too long ago I found myself, as I often do, walking along the corridors of a well-known Fortune 500 corporation in Atlanta, gently being nudged by the numerous signs hanging on the walls. These signs spoke to the values of this company. My client, the Director of Human Resources, spoke to me about these values. She spoke of integrity and communication and about education and knowledge. She highlighted the company’s commitment to customer service and to teamwork. As we discussed the qualities my firm, Aldebaran Associates, should look for in the candidates we source for them, she made sure that I understood how important it was that these candidates “fit” the company’s values and culture. We subsequently presented an extraordinary candidate for a key position and the candidate went through 3 interviews, getting high remarks from all. We were certain she would get an offer. Instead, 2 months later and a couple of dozen messages left through either email or voice mail, we still had not received feedback or a conclusion about this candidate. We were never told if the position was filled, or why they passed on our candidate. Two parties were left hanging in an incomplete conversation. What happened to the values of communication and customer service? Were they intended only for the people inside the company? 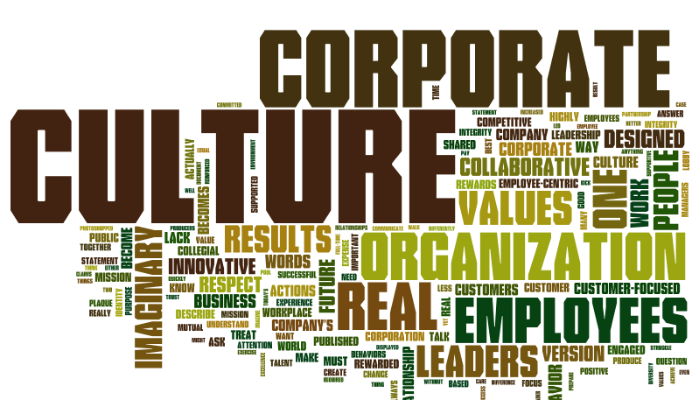 Corporate culture must be created with intention if it is to truly matter and have the kind of impact that an organization has in mind when it speaks of its culture. A company’s values should be so loud that even an outsider is able to recognize them. The people at Amazon have built an enormously successful empire based on one huge value – the customer is always right. And because they believe this to be true, they live it and breathe it every day. They make the process of returns, exchanges, complaints, etc. so easy and pleasant that no matter what happens to your order, you will keep coming back because you know you are valued as highly important. Amazon has been an inspiration for many companies to follow that same value system. This system says that if you take care of your customer, no matter what, they will always come back. And they will say nice things about you to their friends. In this world of social media and connectivity, this is no small matter. Compare this to Molina HealthCare, a market place insurance company that has one of the poorest customer service value systems I know of. A good friend of mine cancelled her policy over a year ago and they are still withdrawing premiums from her bank account. She has escalated her issue numerous times, visited their local offices in person, written letters, and each time she is told they can’t do anything about it. I simply do not understand this! When, as a human resources professional or other person authorized to make hiring decisions, you interview a job applicant it is your responsibility to embody the value systems of your organization. You see, when a candidate leaves your doors, or hangs up the phone with you, they are left with an impression of you and the company. That impression is the seed of how they will relate to your brand. Every time they interact with you that seed grows. They then become a walking billboard for your brand. How people view your brand is a reflection of the values and culture of your organization. Every candidate you invite through an interview process with you is thinking and saying something about your organization. It’s up to you to show up in such a way that what those candidates have to say builds a positive image of you and your brand. What they say about you is a mirror for the culture you say you are building and creating. Ask yourself if you are honoring the values someone said, and you are saying, are the values of the organization. Looking from the outside, as a vendor and provider of services, I am clear that human resources has the power to impact how an organization’s culture is viewed. By modeling behavior that truly reflects the values of the organization, human resources personnel and all those with the authority to make a hiring decision are in a position to make a positive and inspiring difference for the corporation they represent. Regarding your company’s values – know them, breathe them, live them! !